Burma, officially the Republic of the Union of Myanmar, is located in Southeast Asia and is bordered by India, Bangladesh, China, Laos and Thailand. 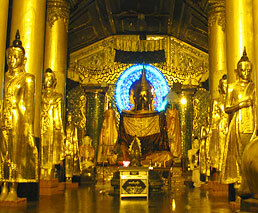 Burma is home to some of the early civilizations of Southeast Asia including the Pyu and the Mon and was later colonized by Britain following three Anglo–Burmese Wars (1824–1885). Then came World War II and Japanese rule. After finally gaining its independence in 1948, Burma suffered one of the longest civil wars anywhere and later, from 1962 to 2011, was governed under harsh military rule. 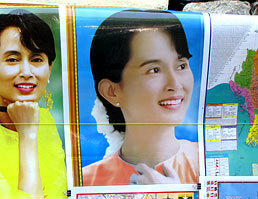 The military junta ended in 2011 following a 2010 general election and a civilian government was born. Until recently, visitors were only limited to one day or if lucky, perhaps one week, but most simply avoided its oppressive turbulence. With a historic victory on April 1, 2012, the imprisoned Nobel Peace Prize laureate and activist, Aung San Suu Kyi, was elected to parliament. Her supporters see her election as a sign — finally promising a positive future for a nation rising from decades of strife and military dictatorship. The doors to this hidden world are now swinging open for us as well! There is a strength which forms in adversity and Burma's people, predominantly Buddhist (89%) and deeply spiritual, rise above their historical oppression and remain good natured, intelligent, easy to approach and delightful to know. One unique advantage of us arranging your Custom Trip: our experienced, friendly and knowledgable local guides who can introduce you to their true culture — to friends and villagers who are at home in the towns you visit; to ancient and culturally significant heritage sites and monuments throughout the country; to amazingly flavorful regional food as well as the abundant wildlife flourishing in this mysterious land. Signs of Burma's own ancient and rich culture is present everywhere, but you will also observe noticeable influences left behind from colonialists and conquerers alike. 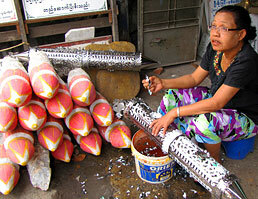 Myanmar encompasses a broad diversity you won't often see. 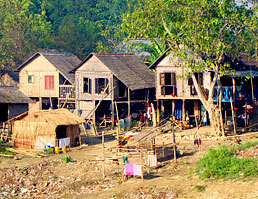 The majority of the country (almost 70%) are ethnically Bamar but there are many other diverse minority ethnic groups such as the Shan, Karin and Mon. The government actually recognizes 135 distinct ethnic types, though most scholars account for 108 different ethnolinguistic groups. While very rich in natural resources, Burma's slow economic growth has actually helped preserve much of its resources, environment and ecosystems — forests with dense tropical growth and valuable teak, acacia, bamboo, ironwood and michelia champaca cover over 49% of the land. 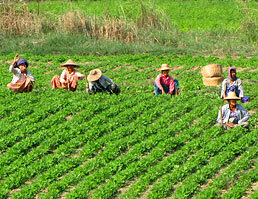 Rice accounts for 60% of the total cultivated land area. Burma also produces many precious stones such as sapphires, pearls, jade and rubies (90% of the world's rubies come from Burma — prized for their purity and hue). 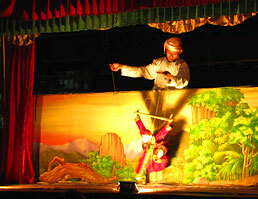 Myanmar has a long tropical coastline to the southwest yet its border also stretches north to the lofty Himalaya. Myanmar's climate varies, as you'd imagine, from north to south but all areas can receive heavy rains during monsoon season — from May to October. Average country temperatures range from 20-24°C (October–February), 30-35°C (March–May) and 25-35°C (June–September). 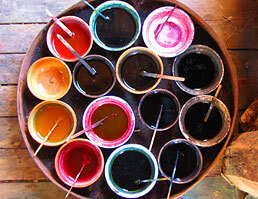 The best time to visit will often depend on what you want to do. For touring, the cooler winter months are most pleasant with prime time from November though February. Even during the wet season, Yangon normally receives morning and afternoon showers while rainfall in Bagan and Mandalay is low. 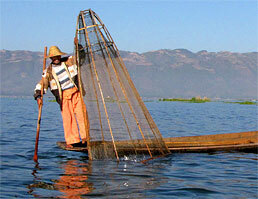 The weather around Inle Lake and in Shan State is pleasant all year, but can be cold at night from December to February. Tourism is now growing exponentially, with increasing numbers of visitors arriving each year straining Burma's limited infrastructure. To experience a time with less tourists, consider shoulder seasons. Flight travel to Myanmar will usually involve a connection in Bangkok or Singapore, main hubs connecting to Burma's largest city and former capitol, Yangon. Transportation framework can often be very limited — trains are mostly outdated and roads are often not large, continuous nor well maintained in many areas. Usually it is best to fly between principal location centers, where we provide a sturdy vehicle and driver to venture out visiting each region's best points of interest. 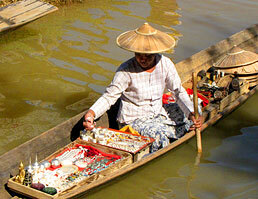 The mega–hotels and amusement parks have thankfully yet to arrive in Myanmar, so don't wait! You'll discover many unique and genuine adventures lie in store! Many visitors get into the local groove riding by horse and cart to explore Bagan's 4000+ ancient Buddhist temples. Or how about a lazy riverboat cruise along the Irrawaddy River between Bagan and legendary Mandalay (...where the flying fishes play...)? Get yourself wet rafting down the Malikha River. Combine water life with a snug room on a live–aboard sailboat excursion offering kayaking, snorkeling and hiking among the 800+ islands found off the coast in the Andaman Sea near Kawthoung (called 'Victory Point' during British times). We can do all that. 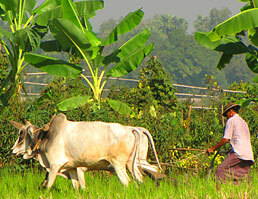 Cycle from Mandalay to Bagan through deep jungle, verdant hills and rural fields. Go trekking in Kachin State along the Himalaya's eastern edge or ambling down hidden jungle trails to visit fascinating communities living in tiny villages dotting the shoreline of Inle Lake. 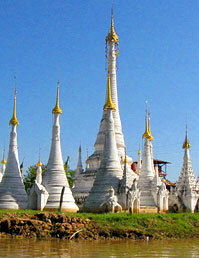 Buddhist pilgrimage and meditation courses are available to deepen your experiences in Burma. Don't forget to just kick–back and take–in the tropical beach at Ngapali too. And there's lots more to this unspoiled land. More than you might imagine! Yes, we can do all that too! Burmese cuisine has been influenced greatly by it's neighbors China, India and Thailand. It's food has unique preparation and distinctive flavors — with regional variations of dishes by the use of an array of fish products such as fish sauces and pastes. 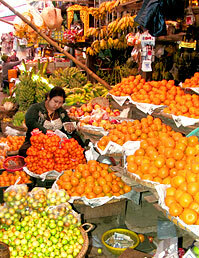 Most ingredients are fresh — fruits are often used in conjunction with vegetables in many dishes. 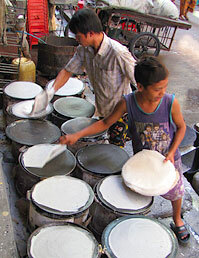 Seafood is a common ingredient in coastal cities, while meat and poultry are more common in cities like Mandalay. 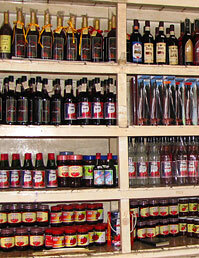 Myanmar's diverse religious makeup also influences its cuisine, as Buddhists avoid beef and Muslims pork. 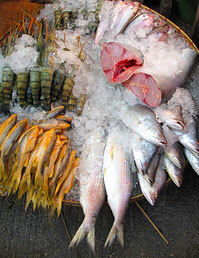 Freshwater fish and shrimp are common in inland cooking as a primary source of protein and are used in a variety of creatively flavorful dishes. Burmese cuisine reveals an array of salads (a thoke) — usually focused on one ingredient, ranging from rice, wheat and rice noodles, glass noodles and vermicelli, to potato, ginger, tomato, kaffir lime, lahpet (pickled tea), and ngapi (fish paste). These salads are popular as fast foods in Burmese cities! A popular Burmese rhyme sums up the traditional favorites: "A thee ma, thayet; a thar ma, wet; a ywet ma, lahpet" or translated "Of all the fruit, the mango's the best; of all the meat, the pork's the best; and of all the leaves, lahpet's the best". Burmese traditionally eat their meals from dishes set on a low table, while sitting on a bamboo mat — the eldest diners are always served first before the rest join in; even when the elders are absent, the first morsel of rice from the pot is scooped and placed aside as an act of respect to one's parents, a custom known as u cha. 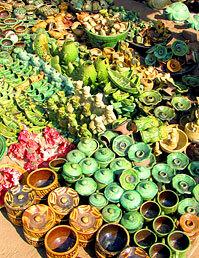 You'll find distinctive craftwork throughout the many villages and markets of Myanmar. Across Asia, one spends time to know shopkeepers and street merchants though the friendly sport of bargaining — research first so you have an idea what something should cost. 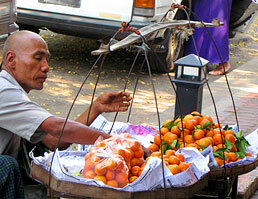 Ask other travelers and our local guides what they think before you bargain! You'll see many fine silks, embroideries, paintings, jewelry, lacquerware, wood carvings and many unique crafts all over the country and you'll likely meet many artisans — proud of their imagination, creations and passion as they create original crafts in their workshops. You can easily find two recent films about Myanmar: "The Lady" and "They Call It Myanmar: Lifting the Curtain." An old classic "Beyond Rangoon" is also a very interesting film as well. For reading materials, good historical fiction includes "Burmese Days" by George and "The Glass Palace" by Amitav Ghosh. Custom Trips are unique by definition. It can seem to be an overwhelming prospect for you to design a Custom Myanmar trip that becomes a rewarding, once–in–a–lifetime success... and that is where we come in! Our local staff are professional and uniquely qualified with uncommon local experience, so you can confidently travel in safety to explore lesser–known, unspoiled areas — you just won't find them elsewhere! Read one traveler's story here (you have enjoyed his photographs on this page too) and one traveler's insightful comment here. 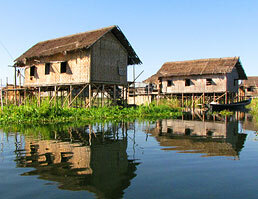 Look through one of our Scheduled Small Group trips to Myanmar here for some location ideas! Many travelers explore Myanmar with us each year and you can too — but you must plan early as more and more visitors are filling available rooms and flights well in advance. Plan and book early! There are many options to keep your trip unique, affordable, enriching and safe. 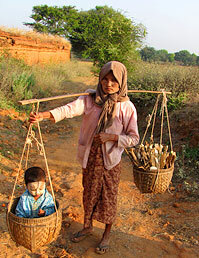 Often a trip to Burma is just part of a longer trip in Southeast Asia. We can help wherever you're bound (Thailand, Cambodia, Vietnam, Laos and on up to the Himalayan lands of Tibet, Bhutan, Nepal and India). 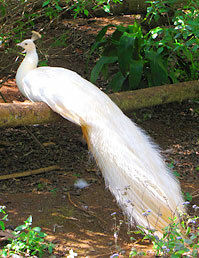 Once you have the ideas for your Burmese adventure, contact us to turn them into the real adventure of your life. Give us your dream and we'll give you back a successful journey that you'll never forget. Our Custom Trips page reviews how you can get started. Passport, Visa(s), Physicians Visit, Emergency Medical & Evacuation Insurance, Travel to/from Gateway City, Meals Beyond Your Itinerary, Beverages, Spending/Personal Money. 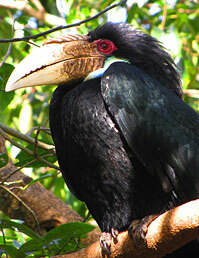 Your Specification: The trip itinerary is based on your interest and input. Events can range from a mild vehicle tour to a long and strenuous trek with accommodation in tents, tea or guest houses and high–level hotels, meals inclusive or exclusive, trail support, cooks and guides — all as you wish.